I am trying out the Blendshapes tool. I have a point selection setup and the slider does move my points, but there is no falloff. I am basically blending between an edit that is scaling the point selection by 0.85 and the base shape. Are there other nodes I can place after the edit to produce a smooth fall off? Another problem I am having with Blendshapes are that they don't maintain their initial effect once the bone has been rotated. In this image you can see the initial Blendshape simply moves points up and down on the Y-axis but once the bone is rotated, the points start shifting along the X-axis of the bone. Both sliders are doing the same thing, simply setting the blend value from 0-1. I guess it is learn a new node day. I have never used the SoftPeak before but works great with Blendshapes. I supply a single point in the middle of my upper arm fat area and adjust the falloff. I have tweaked the slider code to drive the blend1 value based upon a fit range. So when the arm gets close to the body the SoftPeak kicks in and starts deforming that single point along the normal with a soft falloff for all the other points around it. A surprising bonus was when the SoftPeak is near the body it actually pushes the body mesh in the opposite direction normal. 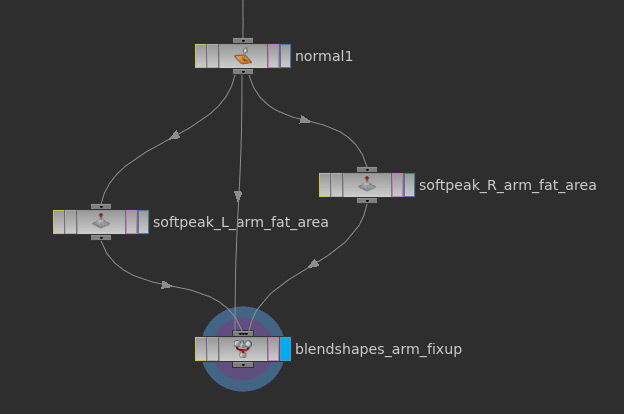 Not sure how you're doing it exactly but make sure to apply the Blendshape SOP right *BEFORE* the Deform SOP, so that the bone rotations don't affect it. Also, use the Edit SOP to build your Shape. It comes with SoftRadius and Sculpt built in. I'm not sure I understand. How is what you described not the same thing as what you quoted me? it is the same thing - i was just comparing it to maya in that the way you explained it is very similar except in maya is a bit more fuss than just shaking and redropping a node :/ and its far more likely to crash!